An absorbent birth to potty pocket nappy. Suitable from around 8-35lbs. In wonderful new prints! 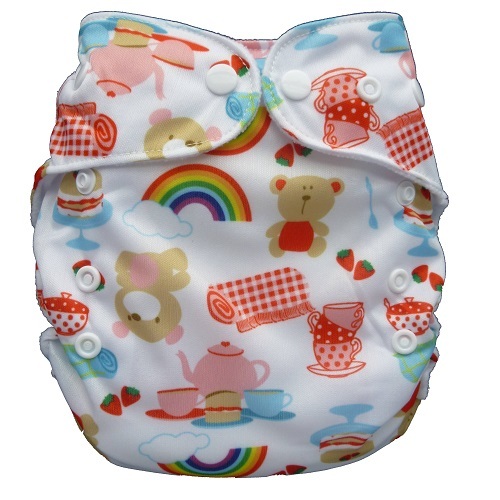 A generously sized, reliable and absorbent reusable pocket nappy. Now available in NEW V3 prints! Wonderoos are a one size nappy, designed to fit babies from around 8-35lbs. Adjust the poppers at the front of the nappy to change the length as your baby grows. This nappy closes with poppers too, which helps to prevent your child taking their nappy off at inconvenient times. 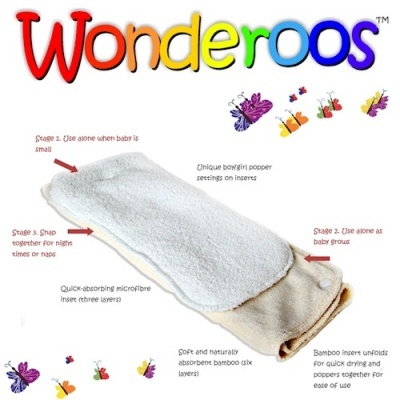 Wonderoos have a soft fleece inner layer for baby's comfort and dryness, a leakproof PUL outer layer, and a generous pocket style opening at the back into which you place one or both of the absorbent inserts. Prewash at least twice to build the absorbency of the inserts. Nappies become more absorbent with more washes.